I was recently reading about the political science and mass communication theory propounded by the German political scientist Elisabeth Noelle-Neumann called "The Spiral Of Silence." People are constantly observing the behaviors of those around them, and seeing which gain approval and disapproval from society. People unconsciously issue their own threats of isolation by showing signals of approval or disapproval. Threats of isolation are avoided by a person’s tendency to refrain from making a statement about something they think might attract objections. People are more willing to publicly state things that they believe will be accepted positively. The spiral effect begins because when people speak out confidently, the opposition feels a greater sense of fear of isolation and is further convinced to stay silent, since they are in the minority. The feelings continue to grow in either direction exponentially. A strong moral component is necessary for the issue to activate the spiral. If there is a social consensus, the spiral will not be activated. There must be two opposing forces. The mass media has a strong influence on this process. Fear and threat of isolation are subconscious processes. The spiral of silence only “holds a sway” over the public for a limited time. If a topic activates the spiral of silence, this means that the issue is a great threat to social cohesion. According to the theory, members of a society can sense when certain minority views gain in popularity. The majority in turn becomes reluctant to express opinions critical of the minority-held view while the minority become emboldened and more vocal about their positions. This cycle creates the illusion that the view of the minority is held by the majority of the populace, pushing the majority view further into the background of the imaginary popular position, creating an artificial majority. The cycle breaks when general consensus is met, and a perfect example in politics that illustrates this fact would be the presidential campaigns of Ross Perot in the nineties, bringing the national debt to the political forefront. The majority parties were quick to integrate this issue into their political platforms, ending the cycle. This theory, when discussing the complete spiral, reminds me of the Tea Party movement and the constant promotion by conservatives claiming their views represent a majority of the nation, despite figures that reveal a minority of the population adhere to or support the Tea Party platform. Looking back at the beginning of the Tea Parties, they were nothing more then disorganized protests located randomly across America, but with increased pressure from politically connected media outlets like Fox News, more positive coverage began to emerge, presenting the Tea Parties as a populist movement representing the will of the nation, not a political fringe dissatisfied with the establishment and then re-branded to appeal to more mainstream conservatives. While there was coverage of the events by news organizations other then right-leaning corporations, conservatives continued to vocalize their opinions, claiming the liberal-biased news outlets were enforcing a blackout of the conservative protests. The mainstream media fell into silence, accepting the right-wing narrative, and then increasing their coverage, avoiding criticism of the minority-led protests. The perceived popularity of the Tea Parties pushed the majority into silence while emboldening the right, which helps explain the anger that erupted at last summer's town hall meetings. Were the angry citizens at the town hall meetings representative of only a small minority of the population? As the illusion that public support increased for the Tea Parties, the minority position grew beyond what initially stemmed from a dissatisfaction with taxes, adopting various other issues that conservatives backed, such as an opposition to health care reform. The Tea Parties framed their cause as a moral one, claiming to be the defenders of American morality and spirituality - consider Glenn Beck's assertion that America is a Christian nation and that "social justice" is not indicative of the religious tenants this nation was supposedly founded upon. The mass media involved themselves in the process every step of the way, pushing conservative propaganda for fear of upsetting the balance, further continuing the spiral of silence. The last two crucial points are perhaps the most important. While we could only hope that the effect of the Tea Parties are temporary, the fact of the matter is that they had already activated the spiral of silence, and it looks as if their assault on America's social cohesion is not going to end anytime soon. Just consider the references to civil war made by popular Tea Party-revered pundits like Rush Limbaugh and Glenn Beck. Kevin I still cannot reach you without switching to Firefox. I find the Tea Parties to be an interesting sociological subject. 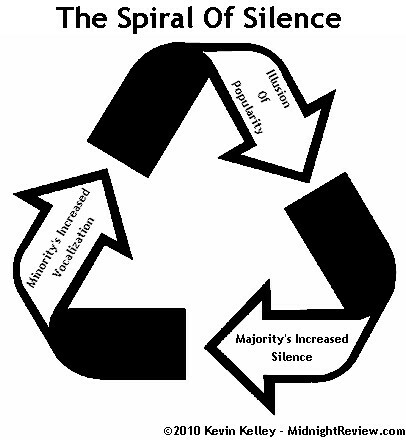 I was reading a book regarding the nature of the American electorate and there was a brief mention of The Spiral of Silence. When I read further, it was easy to connect the dots.